Throughout history many healing traditions have focused on analgesia--the alleviation of pain--an area in which modern medicine provides few options beyond narcotics, steroids, and surgery. For those seeking drug- and surgery-free alternatives or complements to conventional pain management, the choices can be overwhelming. How do you know which method will work for you? 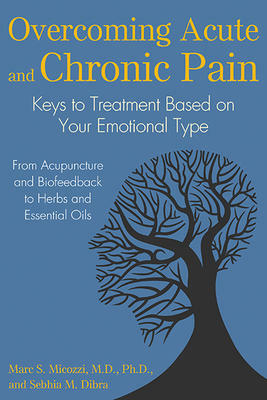 In this guide to safe and effective natural therapies for acute and chronic pain, authors Marc S. Micozzi, M.D., Ph.D., and Sebhia M. Dibra explain how your emotional boundary style--how you react to emotional, social, environmental, and physical stresses--affects which complementary treatments will work best for you. Providing an easy questionnaire to determine your emotional type and an interactive self-assessment for finding the right pain treatment for your condition, they explore the effectiveness of mind-body treatments for each emotional type and for many common pain disorders, including arthritis, back pain, fibromyalgia, irritable bowel, ulcer, migraine headaches, carpal tunnel, anxiety, PTSD, and other chronic pain conditions. They review the available research and scientific evidence in support of each therapy, suggesting only well-established, safe, and clinically proven alternative treatments, such as acupuncture, biofeedback, hypnosis, massage, chiropractic, yoga, herbs, and essential oils. Approaching pain holistically, they reveal how pain should be understood as a dynamic condition--an interaction between mind and body as well as between patient and therapy--and how your emotional type is key to long-lasting and successful results.